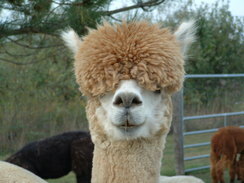 Powder Puff Pacas is a farm located in Lenox, Michigan owned by Suzi Smedes. 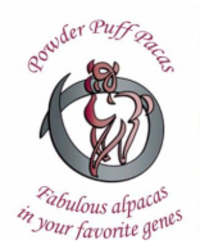 Powder Puff Pacas purchased our first alpacas in 2004, and we’ve been living the alpaca lifestyle ever since! And what a phenomenal lifestyle it is. All of our visitors have been overwhelmed with the beauty and grace of these creatures, and are touched by the peaceful ambience. While we've moved to a larger property, we’ve chosen to remain a somewhat small farm, so that we can easily provide each of our animals very personal, hands-on attention. This style of detailed attention is passed on to our clients as well. Because we know each animal intimately, we are able to work closely with our customers to ensure they are paired with the best selection for their breeding program. Powder Puff Pacas offers a line of huacaya alpacas, in lighter colors, with genetic backgrounds from such noble beasts as Legacy, Victor, Black Magic, Royal Fawn, Conan, and The Aga Khan. We offer breeding and boarding services, and carry a line of very unique alpaca products, including our signature Powder Puffs, felted hats and purses, and knit hats. Visit our boutique and pick up some of these exclusive items. Contact us to schedule a visit soon. We’re happy to have you, your family, friends, school and church groups come by. We can tailor your tour with small activities or background information on alpacas or sales and breeding information.